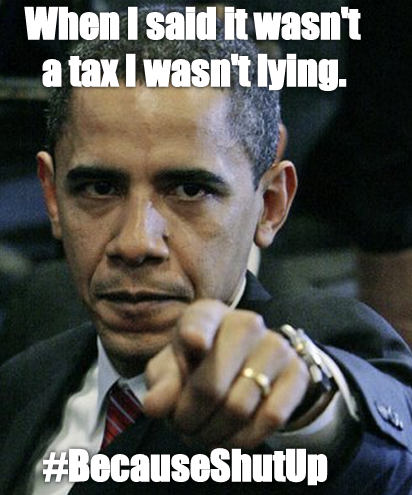 President Obama and members of congress repeatedly and vociferously proclaimed that the penalty imposed by the Affordable Care Act on those who do not purchase health insurance, is not tax. The attorneys representing the Obama Administration before the Supreme Court argued just the opposite. That’s right, the ever forward-looking Obama administration chose to emulate the past. They took the path forged by the FDR administration when the constitutionality of Social Security was argued before the Supreme Court in 1937 in Helvering v. Davis. Even though this tactic is nothing new it’s still deplorable. We were lied to. We were told by our elected officials, (read servants) that in no way shape or form was the mandate a tax. The attorneys at Landmark Legal Foundation foresaw the possibility that the Obama administration would go the FDR route and tried to cut them off at the pass. The Amicus brief they filed, made an appeal to the court that it take into consideration the numerous, on the record remarks made by the President that the mandate was not a tax. Landmark also pointed to the fact that congress neglected to use the word ‘tax’ when crafting the language of the bill. II. SECTION 5000A OF THE PPACA ESTABLISHES AN UNCONSTITUTIONAL TAX. The individual mandate’s penalty provision in 26 U.S.C. Section 5000A (2011) cannot be justified as a permissible tax under any Constitutional test. Arguments proffered by the federal government that this provision constitutes a permissible exercise of Congress’s taxation authority fail under all established precedents and should be rejected by the Court. Court as applicable to other Article I, Section 8 taxes such as excises. Legislative novelty is not necessarily fatal; there is a first time for everything. But sometimes “the most telling indication of [a] severe constitutional problem . . . is the lack of historical precedent” for Congress’s action. Free Enterprise Fund v. Public Company Accounting Oversight Bd., 561 U. S. ___, ___ (2010) (slip op., at 25) (internal quotation marks omitted). At the very least, we should “pause to consider the implications of the Government’s arguments” when confronted with such new conceptions of federal power. Lopez, supra, at 564. Sounds like case closed to me. Clearly we’ve established that congress has no constitutional authority to force citizens to use the fruits of their own labor to purchase a good or service they otherwise would not have. But hold on a minute! We have to allow the government’s attorneys to make the asininely absurd assertion that it’s completely irrelevant that congress never used the word tax when describing the mandate. We should give them the benefit of the doubt that when they wrote penalty they really meant tax. Had the government argued the constitutionality of the mandate based solely upon the claim that congress is permitted to compel the purchase of a good or service under the powers granted to it by either the Commerce Clause or the Necessary and Proper Clause, the mandate would have be struck down. “The exaction the Affordable Care Act imposes on those without health insurance looks like a tax in many respects. The “[s]hared responsibility payment,” as the statute entitles it, is paid into the Treasury by “tax- payer[s]” when they file their tax returns. 26 U. S. C. §5000A(b). It does not apply to individuals who do not pay federal income taxes because their household income is less than the filing threshold in the Internal Revenue Code. §5000A(e)(2). For taxpayers who do owe the payment, its amount is determined by such familiar factors as taxable income, number of dependents, and joint filing status. §§5000A(b)(3), (c)(2), (c)(4). The requirement to pay is found in the Internal Revenue Code and enforced by the IRS, which—as we previously explained—must assess and collect it “in the same manner as taxes.” Supra, at 13–14. This process yields the essential feature of any tax: it produces at least some revenue for the Government. United States v. Kahriger, 345 U. S. 22, 28, n. 4 (1953). Indeed, the payment is expected to raise about $4 billion per year by 2017. Congressional Budget Office, Payments of Penalties for Being Uninsured Under the Patient Protection and Affordable Care Act (Apr. 30, 2010), in Selected CBO Publications Related to Health Care Legislation, 2009–2010, p. 71 (rev. 2010). Tyranny, it’s all the rage. Author Tracy L. ConnorsPosted on June 28, 2012 January 5, 2017 Categories Affordable Care Act, election 2012, news, Obama Care, politics, SCOTUS, thoughtsTags ACA, ACA Ruling, Chief Justice Roberts, commerce clause, individual mandate, Justice Roberts, Liberty and Tyranny, majority opinion, mandates, Mark Levin, necessary and proper clause, Obama Care Ruling, ObamaCare ruling, penalty, SCOTUS, Supreme Court, taxesLeave a comment on Forward to Tax Increases! I repeat, the government doesn’t make money, they take money. The only money that the government has is mine and that of every other tax paying US citizen. The government accumulates our money via taxation then presto ‘government money’. People are overlooking this most basic of principles if they believe that the government has the funds to provide them with health insurance when they cannot afford it themselves. The only thing the government can really give you is your money back. The Talk of the Times Blog at WordPress.com.